Preparing for a Flood – Is Your Property at Risk? Tidal flooding can cause damage to properties and there is no system that can provide 100% protection and safety, however being prepared and ready can help to reduce the impact of flooding on your life. A good idea is to first check if you are in a flood risk area, and to determine how severe the effect of any flood would be for your property. The Environment Agency Flood Information service now provides a long term flood risk assessment for addresses in England. If you want to attempt your own, more specific, assessment the Land Heights section of this web site provides data for estimating what levels of flooding, if any, you could possibly expect in areas which are most at risk. Only a very few homes in the St Denys area are at significant risk of flooding. If your house is one of them you will have probably participated in the Belsize Flood Resilience Project which has improved Community Flood Resilience including providing funding for flood resistance measures implemented for individual homes. But even if your property is not directly at risk, if you live in the area it is a good idea to register for the Free Flood Warnings issued by the Environment Agency. 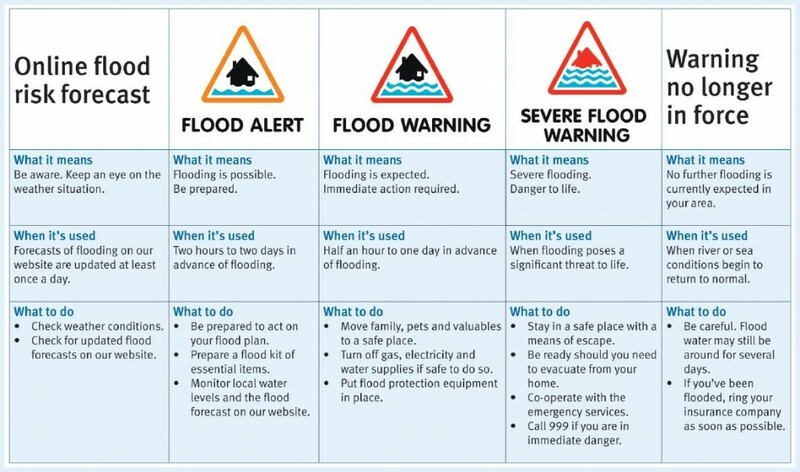 You can sign up for different levels of warning, we strongly recommend that you choose to receive Flood Alerts and Flood Warnings (see below for what these mean). To listen to any flood alerts or warnings you can call the Floodline on 0845 988 1188, select option 1 and when instructed enter Quickdial number 0122121 to select information for the local area. The Environment Agency gives some excellent resources to help you make a Personal Flood Plan to prepare for a flood. These include a Flood Plan Template and advice on preparing your property for possible flooding. Should you wish to go into more detail on preparing for a flood, the Environment Agency has a detailed guide: “Flooding Minimising the Risk” although this relates to flooding in general rather than the more limited tidal flooding likely in the St Denys and West Itchen area. Stay calm – floods in the St Denys/West Itchen area will normally only last an hour or two at most!